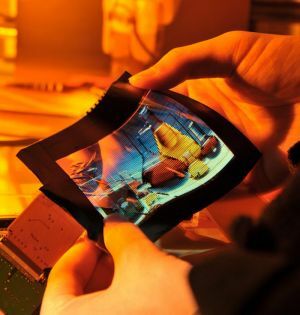 Taiwas's ITRI (Industrial Technology Research Institute) has developed a new 6" flexible color AMOLED, using their FlexUPD technology. The display is just 0.01cm thick, and can continue to show images even when folded. The folding radius can reach 5cm or less, and the screen can be scrolled up to 15,000 times. ITRI says that their FlexUPD technology is the simplest and cheapest technology for mass production paper-like displays. FlexUPD will be commercialized soon, and AUO plans to use it for flexible e-reader products "very soon". FlexUPD's breakthrough is its simultaneous adhesive and non-adhesive bonding -- the use of a "de-bonding layer" -- between the glass and flexible substrate. The de-bonding layer -- inspired by Taiwan crepe-making techniques -- sticks to the production glass substrate firmly during the entire fabrication process and is completely non-adhesive to the polyimide (PI) film stacked on top during this phase -- much like a layer of non-stick material separating the crepe from the pan. This allows the indispensable active matrix backplane for high-quality color displays to be flexible.